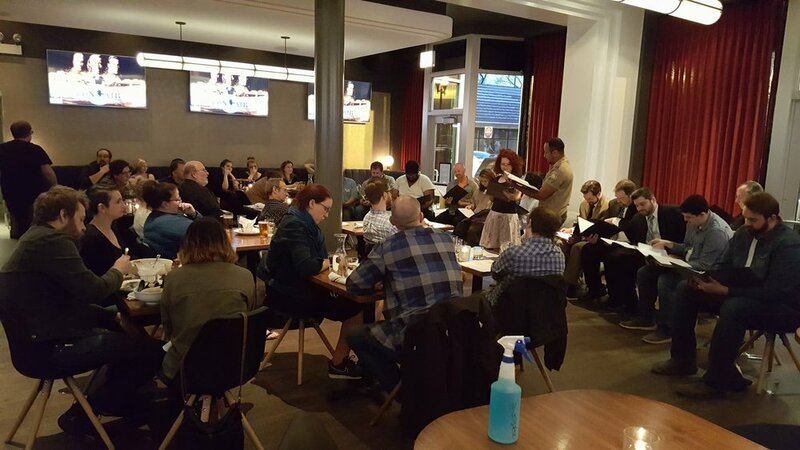 We had a full house for our live reading of Con Air last night at Carbon Arc Bar & Board. Thank you to everyone who attended and who donated to Chicago Veterans. If you weren't able to attend, but want to donate to this local charity, which helps veterans readjust to civilian life (OR if you did attend and want to give more money to the cause), you can donate through the organizations website at ChicagoVeterans.org. Our next Live Reading will be in July (exact date TBA) and we'll bringing the cult hit film The Sandlot to life in celebration of the 25th anniversary of its release. Ghostlight Ensemble presents the next installment of its ongoing live movie reading series: Make A Move & The Bunny Gets It: A Con Air Live Reading. Join us at 7:30 p.m. Monday, May 7, at Carbon Arc Bar & Board (4614 N Lincoln Ave, Chicago, IL 60625), located in the Davis Theater in North Center. Con Air is the 1997 action film starring Nicolas Cage as former war hero Cameron Poe. Poe is sentenced to eight years in prison when he accidentally kills a man in a barroom brawl. When his release comes through, he's eager to see the daughter he's never met, but he finds himself aboard a flight transporting ten of the most dangerous men in the American penal system. When the criminals hijack the plane, Poe has to find a way to get home, keep himself alive, look after his cellmate Baby-O — who will die without proper medicine — and try to help the cops on the ground. There is a suggested donation of $5 at the door, which will help Ghostlight fund its upcoming season, AND an additional donation for Chicago Veterans, a non-profit that helps service members and their families in the Chicagoland area transitioning back to civilian life.